← i finally got it! so, we’re going to start with a little bit of background. when i worked at the group home in college, we had this great recipe for shrimp and sausage paella using chorizo sausage. the whole time we lived in cleveland, i could never find it at our regular grocery store and always meant to make a trip to a nicer store to look for it…three years later, i moved to lansing without having done so. for the last year, i have done the same thing. then, at our normal grocery store one day, i see this little side case i’ve never noticed with a bunch of sausage. lo and behold! i excitedly told mike, whose response was “yeah, i know…didn’t you know that was there?” he thought he had told me about it because he knew of my never-ending quest to find chorizo sausage, but never did (trust me, i would have remembered). so, i bought some yesterday and made the dish for the first time in four years. as delicious as i remembered, even if i was too much of a cheapskate to buy the $15 saffron the recipe calls for. however, i only used half the chorizo so i wanted to find another recipe to use the rest. i also have a red bell pepper that has been patiently waiting to be cooked. i got an idea for some baked mac and cheese using both, and turned to the interwebs for a recipe. however, i didn’t find any that called for both or sounded quite right, so i did a little improvising. i found a basic recipe for baked mac and cheese that didn’t have any extras and just used that for the white sauce recipe. i added the red bell pepper, chorizo, and some bread crumbs and voila! it was absolutely delicious. i am so excited to have found a new dish that both mike and i love! this will definitely become a “regular”. 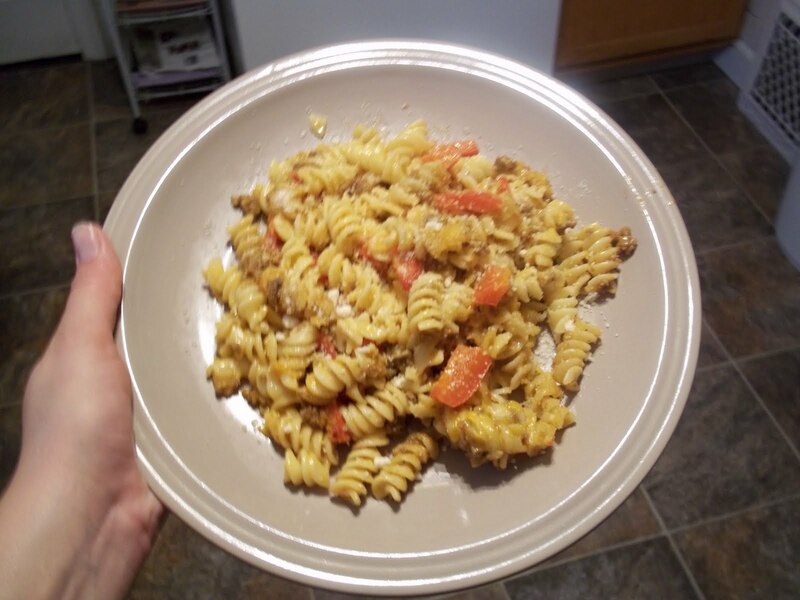 This entry was posted in Cooking and tagged bell peppers, chorizo, cooking, main dish, pasta, sausage. Bookmark the permalink.